Shopify reported second-quarter adjusted earnings of 2 cents per share, a cent better than the same period a year ago and above analysts’ expectations of a loss of 3 cents per share, according to FactSet. The company’s revenue also beat estimates, with Shopify bringing in $245 million, a 62 percent jump from a year ago, topping Wall Street’s expected $234.6 million, according to FactSet. 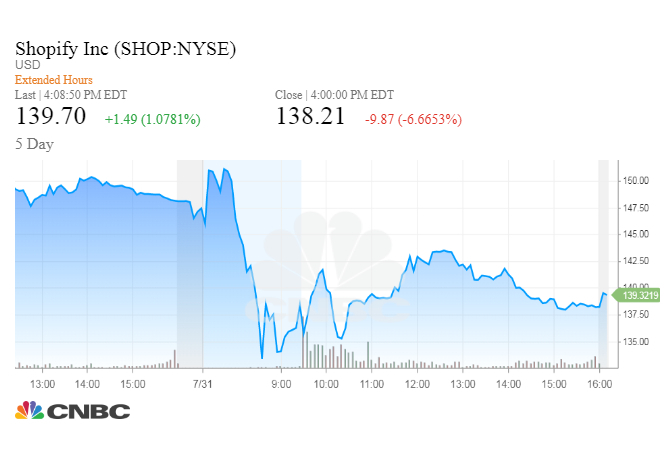 While the top- and bottom-line results were steady, one analyst pointed beyond Shopify’s headline results to a more subtle challenge facing the company. “The incremental dollars were down year over year, which suggests unless there was a radical shift in pricing, which we don’t think there was, net new merchants added were down year over year,” RBC Markets analyst Ross MacMillan told CNBC. “To be clear, we consider this to be ordinary course of business given the pending expiry of the current shelf and we have no current intention to undertake an offer in,” the executive added. If Shopify is not attracting new merchants to its platform, as RBC’s MacMillan suggested, then the company’s forecast for the rest of the year looks even worse. “When you look at full-year guidance, it was a very, very small raise. When you’re trading at this high of a multiple, you can’t have a small raise,” MacMillan said. The company also posted a corrected earnings release on Tuesday. Shopify says the corrections were “minor” changes to its wording, as it updated the words “pay” and “payments” in descriptions of the company’s products.